Senator made campaign stop in Durango in 2008. 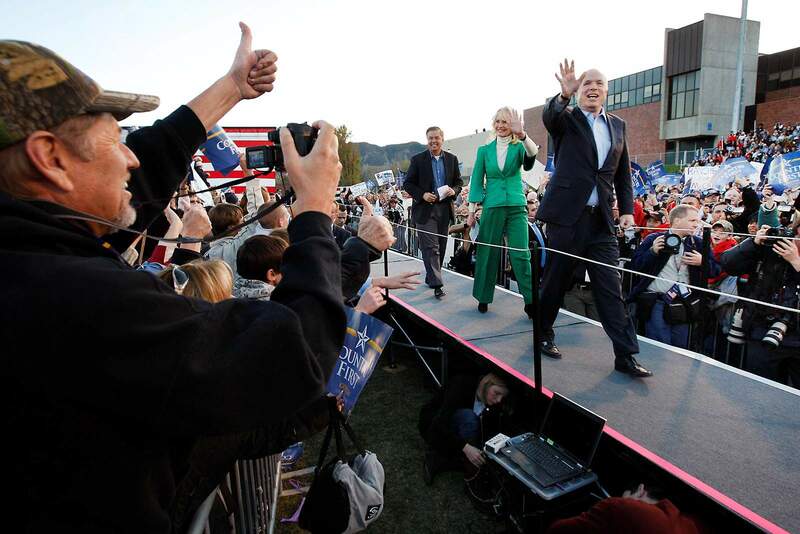 Sen. John McCain made a campaign stop in Durango on Oct. 24, 2008, filling the football stands and field with supporters. McCain, 81, died Saturday at his ranch near Sedona, Arizona, his office announced. McCain, 81, died Saturday at his ranch near Sedona, Arizona, his office announced in a statement. The senator was diagnosed last July with a brain tumor, and his family announced this week that he was discontinuing medical treatment. 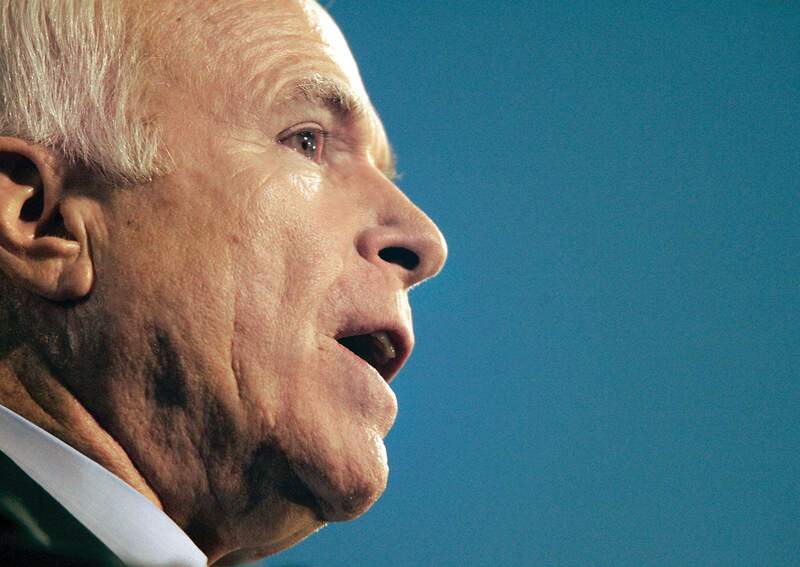 A man who seemed his truest self when outraged, McCain reveled in going up against orthodoxy. The word “maverick” practically became a part of his name. McCain regularly struck at the canons of his party. He ran against the GOP grain by advocating campaign finance reform, liberalized immigration laws and a ban on the CIA’s use of “enhanced interrogation techniques” – widely condemned as torture – against terrorism suspects. To win his most recent re-election battle in 2016, for a sixth term, he positioned himself as a more conventional Republican, unsettling many in his political fan base. But in the era of President Donald Trump, he again became an outlier. 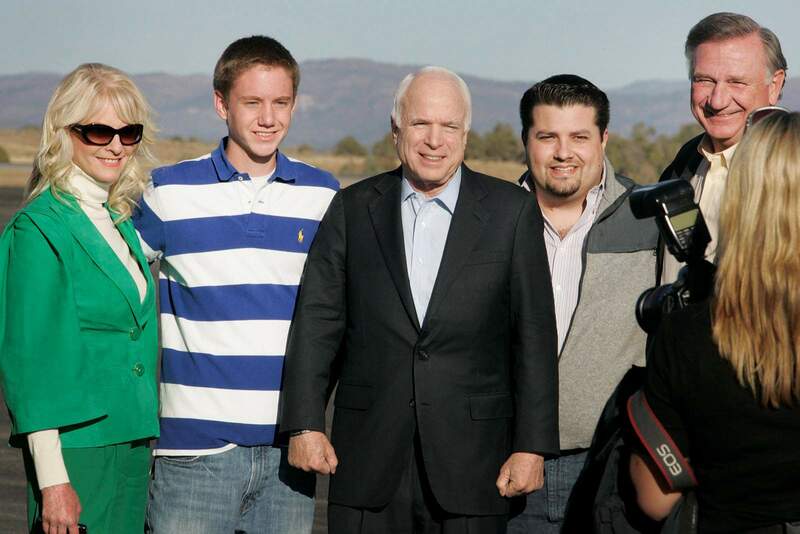 Sen. John McCain and his wife, Cindy, take a photo with Al Harper, right, and his two sons, John, near left, and Jim, near right, after arriving at Durango-La Plata County Airport during a campaign stop in Durango on Oct. 24, 2008. McCain’s most dramatic break with Trump came nine days after the Arizona senator announced on July 19, 2017, that he had been diagnosed with brain cancer. He returned to the Senate chamber, an incision from surgery still fresh above his left eye, and turned thumbs down on a GOP plan to replace the Affordable Care Act. McCain’s no vote, along with those of two other Republicans, sent his party’s signature legislative goal hurtling toward oblivion. In both of his own presidential races, McCain had dubbed his campaign bus the “Straight Talk Express.” To the delight of reporters who traveled with him in 2000, he was accessible and unfiltered, a scrappy underdog who delighted in upsetting the Republican order. So broad and party-bending was his appeal that Senate Democrats in 2001 quietly tried to persuade him to become one of them. In 2004, Democratic presidential nominee John Kerry, a Senate colleague who later became Obama’s secretary of state, considered offering McCain the second spot on his ticket. Sen. John McCain, seen here in Durango in 2008, had been battling brain cancer, and his family announced this past week that he was stopping treatment. McCain’s 2008 presidential campaign turned out to be a far more conventional operation than his first bid for the White House. He stuck to his talking points and came to represent the status quo that he had once promised to topple. One move, however, would come to be regarded as a reckless political gambit. McCain picked as his vice-presidential running mate the little-known, thinly vetted governor of Alaska, Sarah Palin. He represented the end of an era during which the nation looked at wartime military experience as practically mandatory for those who aspire to high office. “McCain was part of the tradition of being able to say, ‘I did public service when I was young,’” historian Douglas Brinkley said. McCain, who rose to become chairman of the Armed Services Committee, was among the Republicans’ most hawkish leaders on military matters and foreign affairs. During the Iraq war, often compared to Vietnam, McCain was an early and ardent proponent of a 2007 “surge” of troops. President Bush ultimately adopted that strategy, and it was widely credited with stabilizing Iraq, albeit temporarily. McCain was also a persistent critic of Obama’s foreign policy. HHHJohn Sidney McCain III was born Aug. 29, 1936, in the Panama Canal Zone and into a family whose military lineage included an ancestor who served as an aide to Gen. George Washington during the Revolutionary War. He was named for the first father and son in Navy history to become full admirals: John S. “Slew” McCain Sr., a top Pacific-theater commander in World War II, and John S. McCain Jr., commander for all armed forces in the Pacific during the Vietnam War. The middle of three children, McCain manifested his famously hot temper early: As a toddler, he would hold his breath until he blacked out. His tantrums were so severe that a Navy doctor advised his father and mother, the former Roberta Wright, to drop him, fully clothed, into a bathtub of icy water at the first sign of an outburst. At Annapolis, he rebelled against the hazing and the regulations and racked up so many demerits that he was at risk of expulsion. (That, too, was something of a family tradition.) As McCain often boasted later in life, he graduated fifth from the bottom of the 899-member class of 1958. 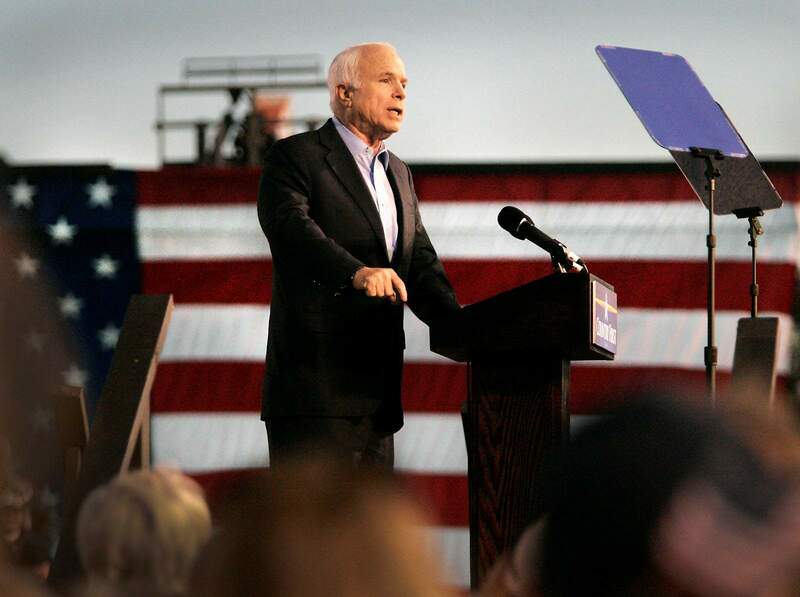 Senator John McCain made a campaign stop in Durango on Oct. 24, 2008, filling the football stands and field with supporters. One girlfriend at the time was a stripper who went by the professional name Marie, the Flame of Florida. McCain recalled taking her as his date to a party of young officers and their mannerly wives. Marie became bored, drew a switchblade from her purse, popped it open and cleaned her fingernails. He did a stint as a flight instructor in Meridian, Mississippi, at McCain Field, named for his grandfather. It was there, McCain said, that he matured and became dedicated to distinguishing himself as a pilot. McCain also became involved in a serious romance, with Carol Shepp of Philadelphia, whom he had known since his days at the academy. They wed in July 1965, and he soon adopted her two sons from a previous marriage, Douglas and Andrew. The couple later had a daughter, Sidney. McCain requested and got orders to do a Vietnam combat tour, joining a squadron on the supercarrier Forrestal in the Tonkin Gulf. On July 29, 1967, having flown five uneventful bombing runs over North Vietnam, he was preparing for takeoff when a missile accidentally fired from a nearby fighter struck the fuel tank of his A-4 Skyhawk, McCain wrote in his memoir. It set off explosions and a fire that killed 134 crewmen, destroyed more than 20 planes and disabled the ship so severely that it took two years to repair. His own injuries being relatively – and miraculously – minor, McCain, then a lieutenant commander, volunteered for dangerous duty on the undermanned carrier Oriskany. He joined a squadron nicknamed the Saints that was known for its daring; that year, one-third of its pilots would be killed or captured. HHHOn Oct. 26, 1967, McCain was on his 23rd mission and his first attack on the enemy capital, Hanoi. He dove his A-4 on a thermal power plant near a lake in the center of the city. So began 5½ years of torture and imprisonment, nearly half of it spent in solitary confinement. During that time, his only means of communicating with other prisoners was by tapping out the alphabet through the walls. The North Vietnamese, however, perceived that there was propaganda value in the prisoner. They called him the “crown prince” and assigned a cellmate to nurse him back to health. As brutal as his treatment was, McCain later said, prisoners who lacked his celebrity endured worse. Shortly before his father assumed command of the war in the Pacific in 1968, McCain was offered early release. He refused because it would have been a violation of the Navy code of conduct, which prohibited him from accepting freedom before those who had been held longer. In March 1973, nearly two months after the Paris peace accords were signed, McCain and the other prisoners were released in four increments, in the order in which they had been captured. He was 36 years old and emaciated. The effects of his injuries lingered for the rest of his life: McCain was unable to lift his arms enough to comb his own prematurely gray hair, could only shrug off his suit jacket and walked with a stiff-legged gait. HHHMcCain had hoped to remain in the Navy, but it became clear that his disabilities would limit his prospects for advancement. In the meantime, he found himself drawn toward the civilian world of politics – and it toward him. Hobbling on crutches in his dress-white service uniform, he shook President Richard M. Nixon’s hand. McCain also struck up a friendship with then-California Gov. Ronald Reagan, who invited the former POW to speak at an annual prayer breakfast in Sacramento. McCain’s marriage, meanwhile, frayed and fell apart. That was not an unusual story among returning Vietnam POWs, and in his case, the dissolution was aggravated by his infidelities. While he and his wife were separated, McCain visited Hawaii, where he met Cindy Hensley, the daughter of a wealthy Arizona beer distributor. A few months after his divorce became final in 1980, he married Hensley. Then-Sen. William Cohen, R-Maine, later to be a defense secretary, was his best man, and then-Sen. Gary Hart, D-Colo., a future presidential contender, was an usher. The couple had three children: Meghan McCain, who became a media personality and blogger; and sons Jimmy McCain and Jack McCain, both of whom served in the military. They also adopted a daughter, Bridget McCain, whom Cindy had met while visiting an orphanage in Bangladesh. McCain retired from the Navy at the rank of captain and moved to Arizona in 1981, with an eye toward running for Congress. The opportunity presented itself the next January when a longtime Republican congressman, John Rhodes, announced his retirement. That same day, the McCains bought a house in Rhodes’ Phoenix district, and John McCain was soon in a race against three other candidates. He was called an opportunist and a carpetbagger – accusations he dispatched with a single answer at a candidate forum. McCain was a Capitol Hill celebrity from the moment he was elected to the House. In many areas, he was a reliably conservative voice and vote. But from the beginning, he showed what became a trademark streak of independence. He called for the withdrawal of Marines from Lebanon in 1983 after a terrorist bombing left 241 U.S. service members dead; he voted to override Reagan’s veto of sanctions against the apartheid regime of South Africa in 1986. And – surprisingly to many – as a member of the Senate, he worked to normalize relations with Vietnam. One of the greatest setbacks for McCain, who had styled himself an idealist and a reformer, came in 1989, when his name became associated with a scandal. He and four other senators – all Democrats – were accused of trying to pressure federal bank regulators to back off an investigation of Charles Keating Jr., a high-living Arizona businessman whose savings and loan collapsed and cost taxpayers more than $3 billion. 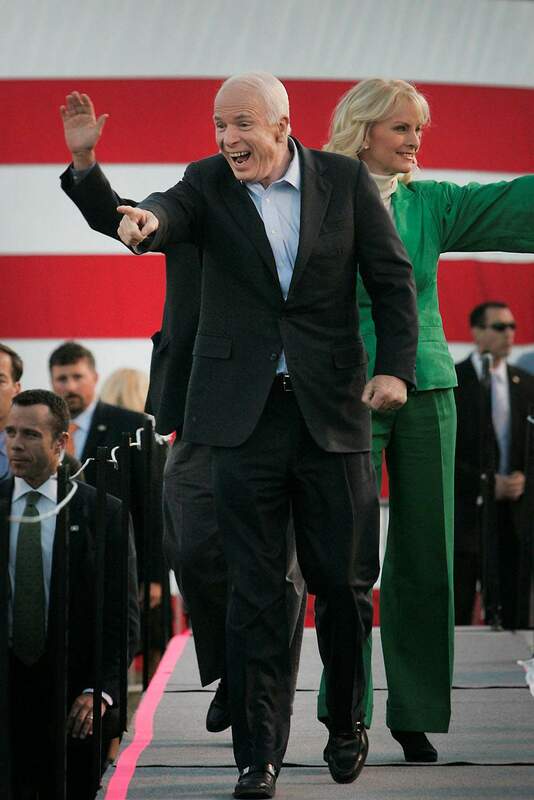 Over the years, Keating had contributed heavily to McCain’s House and Senate campaigns. The senator’s family had taken at least nine trips, at Keating’s expense, to the Bahamas, where Keating had a luxurious vacation estate. The Senate Ethics Committee finally determined that McCain had not done anything more serious than showing “poor judgment” by attending two meetings with the regulators and the four other senators. It was the lightest reprimand the committee gave in connection with the scandal. The others were rebuked but were not charged with crimes. The experience also lit the fire for what would become his signature issue and biggest legislative achievement: an overhaul of campaign finance laws. McCain teamed up with one of the Senate’s most liberal members, Russell Feingold, D-Wis., to author a measure that called for the most dramatic change to the system since the post-Watergate reforms of 1974. It took them more than seven years to get the legislation through. The 2002 law’s main thrust was to ban unlimited, unregulated “soft money” donations to parties, which were used as a means of skirting the contribution limits to individual candidates. HHHWhen McCain announced in September 1999 that he was running for the Republican nomination for president, it was yet another assault on the political establishment, which had put its chips on then-Texas Gov. Bush, the son of a former president. McCain was the target of rumors: that he had fathered a black child (twisting the facts about his dark-skinned adopted daughter); that his wife had a drug habit (she acknowledged having been addicted to painkillers and stealing them from a charity she ran); that his years as a POW had left him brainwashed and insane. One of his regrets, he later said, was getting tangled up in South Carolina’s emotional debate about flying the Confederate flag at the capitol in Columbia. After describing the banner as “a symbol of racism and slavery,” McCain bowed to the pleas of his panicked strategists and issued a statement saying he could “understand both sides” of the question. 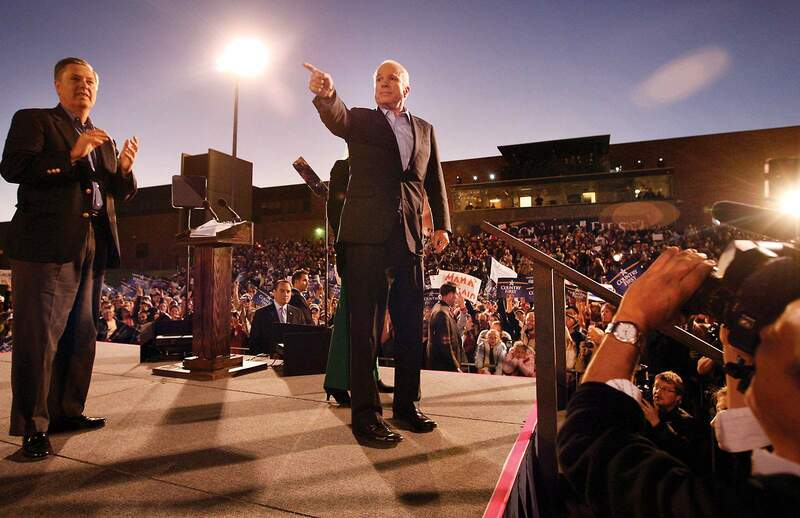 Senator John McCain made a campaign stop at Durango High School on Oct. 24, 2008, filling the football stands and field with supporters. McCain, 81, died Saturday at his ranch near Sedona, Arizona, his office announced in a statement. But by the time he ran again in 2008, McCain had come to terms with Bush and the Republican Party, and they with him. He not only voted to extend the tax cuts in 2006, but also advocated making them permanent. The shift rightward caused a breach with a constituency that McCain had long counted as in his corner: the media. “Are you going into crazy base world?” comedian Jon Stewart asked McCain during an appearance on Comedy Central’s “The Daily Show” a few weeks before the speech at Liberty. “I’m afraid so,” McCain deadpanned. His campaign all but collapsed in summer 2007, but McCain battled back and won the nomination. “Thank you one last time for making me the luckiest guy I know,” said Sen. John McCain, who died of cancer Saturday at age 81. When McCain got the gavel of the Armed Services Committee in 2015, he told The Post that he was having more fun than at any time since his 2000 presidential campaign. That same year, he announced plans to run for a sixth term in the Senate.